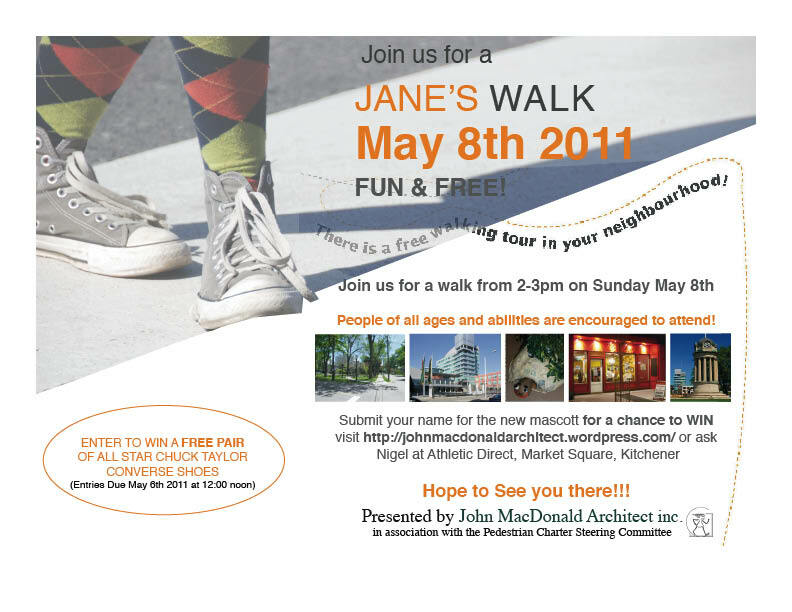 As part of our firm’s commitment to community outreach, and the Pedestrian Charter’s mandate for promoting walkable cities, the two organizations have teamed up to create the ‘name the turtle contest’ in conjunction with our upcoming Jane’s Walk May 8th. Over the next week, leading up to the May 8th Jane’s Walk, you can submit an entry with your name for the turtle, for a chance to win a free pair of Converse shoes from Nigel’s Athletic Direct. Entries are being accepted by email to cailin@johnmacdonaldarchitect.ca or in person at Nigel’s Athletic Direct, Market Square, Kitchener. The turtle will lead the upcoming Jane’s Walk, and will act as the mascot for the Pedestrian Charter Steering Committee here in the Region. Join us for the walk, rain or shine, next Sunday May 8th at Hibner Park as we walk with the turtle to city hall, the Silverspoon and then to the Victoria Park Clock Tower as we explore our city! This entry was posted in Community, Design, Health on 2011/04/28 by adminjma.